Overview - In a tiny traditional Peruvian seaside village, Miguel (Christian Mercado), a young fisherman, and his beautiful bride, Mariela (Tatiana Astengo), are about to welcome their first child. But Miguel has a secret: he’s in love with Santiago (Manolo Cardona), a painter who is ostracized by the town because he’s gay. As this strikingly original romantic drama unfolds, Miguel must find the courage to be true to himself. His bittersweet, and ultimately uplifting personal journey exemplifies the essence of what it means to be a man. What makes a man, a man? Is it his strength? His paycheck? His conquests? His pride? This is the deceptively simple question that Javier Fuentes-Leon's award-winning Peruvian drama 'Undertow' asks. While Hollywood has fed us various answers over the years, usually involving macho attitudes and crazy explosions, 'Undertow' probes deeper and instead comes to a more personal, insightful, and truthful conclusion. The plot is a strange, but wonderful mix of romantic drama and restrained supernatural ghost story following an average Peruvian fisherman named Miguel (Cristian Mercado). A good-hearted man, Miguel has a nice, quiet life with his pregnant wife Mariela (Tatiana Astengo). Unbeknownst to Mariela, though, her husband is also engaged in an affair with a local painter named Santiago (Manola Cardona). Refusing to accept his own sexuality, Miguel juggles his love for Santiago with his responsibilities toward his wife and the strict, judging eyes of his town and church. I don't want to give too much away, but a supernatural element does soon find its way into the story and from there it weaves a bittersweet tale of love and acceptance, one that does indeed provide an answer to that all important question -- what makes a man? While not the most original plot, the film does provide a refreshing take on familiar material that finds a strong balance between the drama and fantastical elements. In fact, the supernatural aspects are handled in such a matter-of-fact, no fuss manner that they integrate into the story surprisingly well. While the ghost story twist of the plot could have potentially come across as unnecessary or gimmicky, instead the director has wisely used it to bolster the deeper themes by creating some rather poignant metaphors and parallels to one's struggle for societal acceptance. One scene in particular, which sees our two male leads finally able to walk down the street hand in hand, is wonderfully powerful yet perfectly understated. It's a perfect example of greater allusions being drawn from fantasy. The three leads each provide brave and multifaceted performances. While any one of them could have come across as unlikeable at several points throughout the movie, they are each able to still elicit sympathy by crafting complicated, fully realized individuals. Mercado in particular plays Miguel's slow journey toward self-realization and acceptance with just the right amount of compassion and frustration. The choices made by the characters in this film are not easy and the acting, script, and direction never take shortcuts. Though an overall successful film, 'Undertow' does still suffer a bit from a been there, done that feel. Stories of love triangles involving married gay men have become rather prevalent, and though handled with a strong level of insight and sensitivity, even with its fantasy twist, it still feels a bit generic. Thankfully though, the craftsmanship and sheer heart evident throughout make up for the somewhat recognizable plotting. Through one man's bittersweet journey toward embracing his own identity, 'Undertow' paints an emotional and honest portrayal of love and tough choices. At the conclusion, Miguel finally discovers what truly makes a man, and the answer, though seemingly simple, is much harder to put into practice. 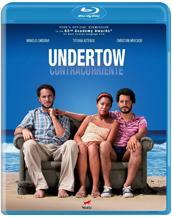 'Undertow' comes to Blu-ray in a 1080p/AVC transfer in the 1.77:1 aspect ratio. Unfortunately, this is not a very impressive presentation. Shot on 16mm film, there is naturally a heavy amount of grain and some unwanted noise. Fine detail is disappointingly absent and there is an overall flat and soft look to the picture. Colors are decent enough, though a bit subdued. Contrast is a little low and blacks waver between a nice deep shade and a lighter gray. And while the cinematography itself can be a beautiful showcase of the serene beaches of Peru, the presentation lacks any kind of impressive detail or depth. In the end, the video transfer shows the film's lower budget roots and resembles a standard definition upconvert more than an actual high-definition release, with little evidence of any of the more prominent benefits of the Blu-ray medium. Though the packaging indicates a Dolby Digital presentation, 'Undertow' is actually provided with Spanish DTS-HD Master Audio 5.1 and 2.0 tracks. Hardcoded English subtitles are also included. The audio here is purely functional. Surround use is infrequent with only some minor ambient effects and a few music cues being sent to the rears. Any kind of directionality between the front soundstage is also rare. Dynamic range is flat and bass is basically absent. Still, balance between elements isn't bad, and the dialogue itself is nice, clean, and easy to understand. While not impressive by any means, the audio track does suit the film well and gets the job done. Wolfe Video has provided a decent assortment of supplements including some interviews and deleted scenes. All of the extras are presented in standard definition with Dolby Digital stereo tracks and hardcoded English subtitles unless otherwise noted. Undertow: A Look Inside (1080i, 18 min) - This is a fairly comprehensive interview with the film's writer and director Javier Fuentes-Leon. He discusses the evolution of the story which started as a film school writing assignment, the personal nature of the script, the casting process, the themes, and even fills in some back-story for the characters that isn't included in the movie. Definitely worth a look. Interview with Cristian Mercado (SD, 5 min) - A brief interview with actor Cristian Mercado as he talks about the film's story and his approach toward playing his character. This isn't the most interesting interview, but fans might want to check it out. Interview with Tatiana Astengo (SD, 5 min) - An interview with actress Tatiana Astengo and like the previous supplement, it features her discussing similar topics about her approach to the character as well as some insights into the improvisational rehearsal process. Behind the Scenes Featurette (SD, 11 min) - This is a basic behind-the-scenes look at the making of the movie featuring on-set footage and interviews with the filmmakers and cast. Unfortunately, most of the information covered here was already discussed in the previous supplements, though there are some extra bits relating to the locations used and the familial atmosphere that developed between the crew. Deleted Scenes (SD, 23 min) - Twenty deleted scenes are included and viewable in one chunk with chapter breaks. These are mostly brief and disposable extensions of sequences in the film, but some do serve to flesh out a few plot points, particularly those that feature more examples of Miguel's conflicts with religion and homophobia among his friends. Trailer (SD, 2 min) - The film's trailer provided in standard definition. GLAAD PSA (SD, 30 sec) - This is a short PSA for the GLAAD organization featuring 'Modern Family' actress Sofia Vergara presented in Spanish with no subtitle options. I don't speak Spanish, so… I have no idea what she said. Trailers for New Wolfe Movies - Trailers for four more Wolfe Video releases in standard definition and 1080p with Dolby Digital stereo sound. 'Undertow' is a refreshingly sensitive and insightful exploration of love and hardship. While some elements of its plot do seem a bit too familiar, the director's particular take on the material is still unique and strong. Video and audio are not very impressive, but seem to accurately represent the low budget production. Supplements are decent, but not great. Still, this release is certainly worth a look.